Growth form: Annual herb. Flowering. Feb–Mar. Status: Native. Very common. Also recorded: Bahrain, Kuwait, E Saudi Arabia, UAE. Habitat & distribution: Occasional to frequent in sandy habitats. 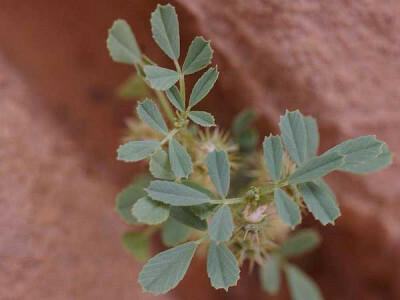 Uses: Said to be ‘palatable grazing’ by Batanouny, although El Amin says it is grazed by animals but not much liked because of the bristly fruit. Notes: A very variable species that was formerly separated into two species or varieties (see Mandaville).